The overlap liner is seen from the outside of an above ground swimming pool. It hangs over the sidewall. 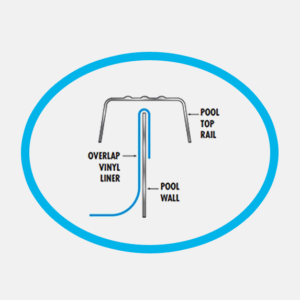 Overlap liners can also be built with expandable vinyl material for deeper style bottom pools. There are fewer patterns available with overlap liners. Typically a pattern on a pool liner is at water level. 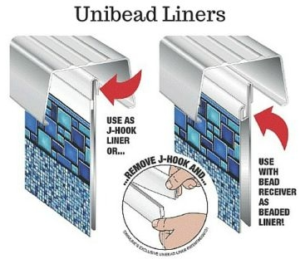 Overlap liners are stretched over the top of the wall when being installed and having extra material overlap liners tend to have larger repetitive patterns that go down below the water line so you do not notice any variations. There are the 6 Common Above Ground Pool Liner Attachments. For more information or if you need to order an A.G. pool liner replacement please visit us at www.abovegroundpoolbuilder.com/pool-liner-replacement and we will walk you through the entire process. You can send us pictures and video so we can understand your needs and get you the pool liner you need.